Chocolate and peppermint. A holiday combo made in heaven. Melt chocolate chips and parowax in a double boiler. Line 2 baking sheets with parchment or wax paper. Mix about three quarters of the candy canes and peppermint extract into the chocolate. Spread half of the mixture on each of the baking sheets. Sprinkle the remaining candy canes on the top of the chocolate. Allow to cool completely (you can put it in the fridge.) Once completely hardened and cooled, break into pieces and package for gift giving! just curious about the "parowax". What purpose does it serve? It sounds kind of icky but I've never heard of it until today. 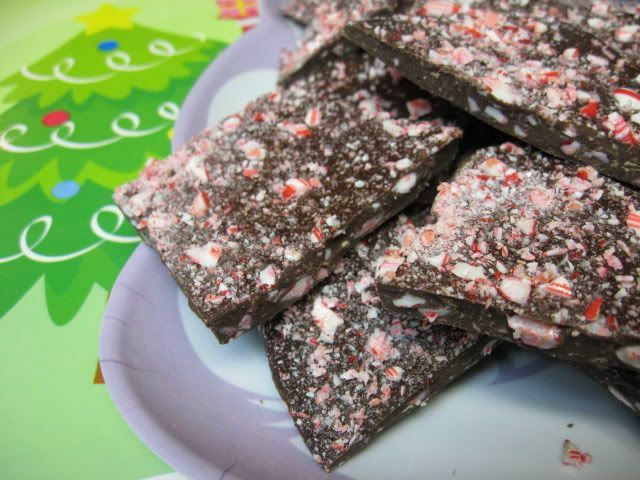 I used to make White Peppermint bark with my mom every year. The past two years I didn't get to because I'm vegan but I'm hoping to find some good white chocolate chips! veganmomma...you can leave it out...it helps to keep the chocolate shiny and solid at room temperature. It's commonly used in candymaking to help keep the chocolate from getting cloudy and soft. you can't taste it. Thanks, I was just curious but I guess that makes sense. You saved me! I was just considering paying something like $30 to order a very small amount of this when I stumbled upon your recipe. It looks delicious! I can't wait to make it.